Belgian endive, as the name suggests, was first a product of Belgium (though there are now many growers in North America). So, why the heck am I pairing it with Asian ingredients, such as rice noodles, ginger and soy sauce? Why should the Belgians get to have all the fun, I say? Endive, with its fresh, crisp texture and slightly bitter taste is a versatile vegetable that can be eaten raw in salads, braised and layered in casseroles or paired with other savory ingredients, such as chicken or fish. Versatility aside, endive has some surprising health benefits, ones too important to overlook. When I was first approached by Discover Endive to be part of a group of bloggers who would collectively be known as OnDivas (be sure to follow our tweets under the hashtag #OnDiva and the Delicious Endive Recipes board on Pinterest), I started to do my research. If I was going to promote the health benefits of endive, I wanted to know the details. What I found was both surprising and encouraging. One head of endive measures in at 87 calories, with 16 grams of dietary fiber and 6 grams of protein (that’s impressive!). It’s also a good source of Vitamins A, C, E and K; calcium; iron; and potassium. On top of all of that, a study in the Netherlands, which included more than 62,000 women, recently found that there was a 75% reduction in ovarian cancer for those who ate endive. Now, those are numbers I can get behind. Slap that “OnDiva” label on me – I’m sold! Be sure to follow the other OnDiva blogs over the next several months for other endive recipes. These blogs are written by Rachael of La Fujimama, Winnie of Healthy Green Kitchen, Carolyn of All Day I Dream About Food and Paula of Bell’alimento. Combine all ingredients in a small bowl and whisk until combined. Cook rice noodles according to package instructions, rinse in cold water and set aside. Heat canola in a large skillet set over medium-high heat. Add shrimp and cook until the shrimp is just cooked through, about 2 minutes per side. Take care not to overcook the shrimp or they will become rubbery. Cut the endive in quarters lengthwise and slice into 1/2-inch pieces. 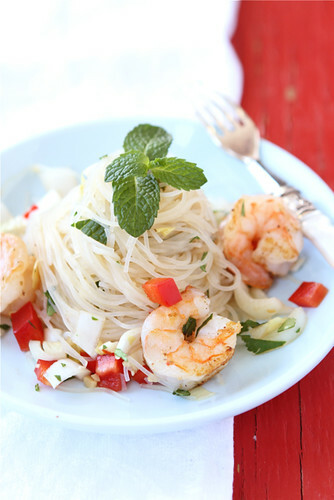 In a large bowl, combine cooked rice noodles, cooked shrimp, endive, red bell pepper, mint and cilantro. Pour in dressing and toss the salad to combine all of the ingredients. Serve. 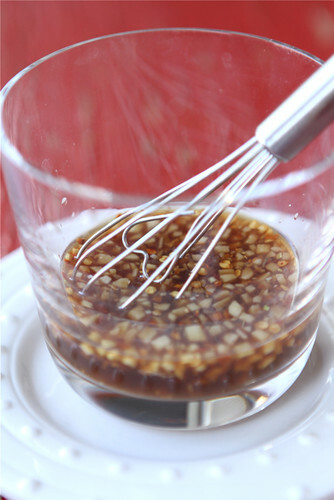 For the dressing: Combine all ingredients in a small bowl and whisk until combined. For the salad: Cook rice noodles according to package instructions, rinse in cold water and set aside. Meanwhile, cut the endive in quarters lengthwise and slice into ½-inch pieces. Disclaimer: This post is sponsored by Discover Endive. As usual, all opinions are my own. What a gorgeous plate this is! And creative use of endive. Love the colors. Look at you, you Endive Diva!! SO bright and pretty, love your photos!! AND you just won my heart. I’ve seen endive leaves used as vessel for an appetizer, but I’ve always wondered if there was a way to use them in dinner on a regular evening. Thanks for the idea! I’ll definitely try this soon. So many fresh flavors in this: ginger, lime, cilantro… I’m in love. This looks so delicious Dara! 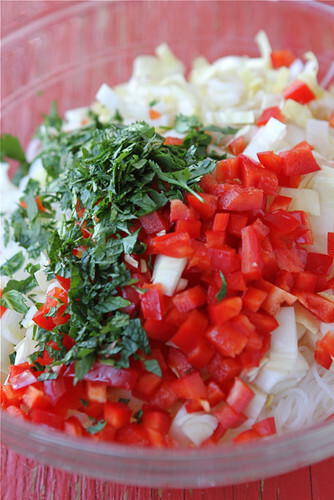 I love rice noodles – in a salad, or soup or stir fry! This is a very unique dish with the endives! I would like this to be my dinner tonight! So bright, beautiful *and* healthy… truly inspired. Sounds delicious, and such an interesting combination of ingredients. What a bright, fun, healthy and cheerful dish! Just what I need in the cold, gray winter months! Thanks Dara! What a delicious recipe. So simple and so delish! Yummy! Lovely, yummy and healthy! I am not sure why more people don’t make these tasty nutritious Asian salads more often. I recall my first time – I was over the moon by the delicious flavour and the ease of preparation… and there is such variety! I love finding other recipes like this! Thanks for sharing the health benefits of endive and for coming up with this light and healthy recipe using this cancer-fighting veggie. Oh man Dara, that looks so refreshing! 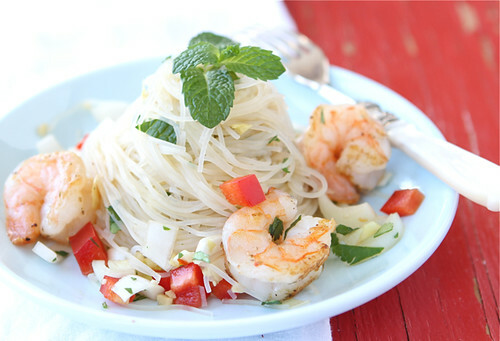 Asian cellophane noodles are one of my go-to dishes, especially with grilled shrimp. You are a diva, endive or not! I’ve only had Belgian endives a handful of times in my life, but I really need to incorporate them into my diet more! this salad sounds like the perfect place to start! I love these fresh Asian flavors. I have to admit that I’m not really a big fan of endives, but this salad looks so gorgeous that I must give it a try. Lovely photos! I have been a silent follower of your beautiful space and I must tell you that I love your blog. I am on healthy eating offlate and this recipe is a keeper for sure. Looks so yum. I love endives, first time I had it was in a salad with radicchio ( the recipe was from the South beach diet book). I came across your blog from the campblog away site. I am planning to attend it and if I make it, I am so excited to meet you in person. This recipe sounds as delish as it looks Dara and thanks for all the great nutritional information on endive. I liked it before and I like it even more now. Happy New Year! I don’t use endive often, but I think I need to change that! Hi Dara. I LOVE endive. I’ve been dipping it in salsa lately for a snack. (I’m on weight watchers, and it makes a fresh, delicious point free treat). I’ve bookmarked this recipe and will be making it soon. I am SOOOO glad I found your site, thank you so much for your wonderful ideas, recipes and photos!!!! Have a good day. 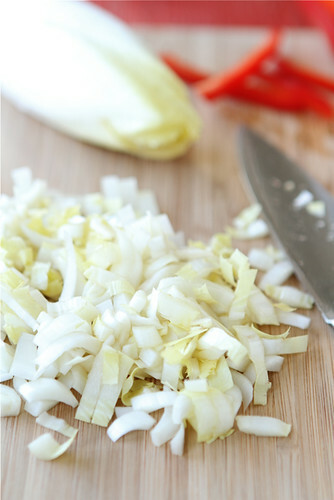 I have never used endive much….so it is exciting to hear that there will be many recipes for me to explore. Thank you for sharing your noodle salad with me! From first word to last, I was glad I visited you and your site today. I hope this finds you happy and well. Much love.